A ‘fact-finding’ team of BJP MPs was today stopped from visiting violence-hit Kaliachak by district authorities and turned back from the railway station, intensifying the war of words between the party and ruling Trinamool Congress in poll-bound West Bengal. MPs Bhupendra Yadav, Ram Vilas Vedanti and SS Ahluwalia, the BJP member of Parliament from the state, disembarked from Gaur Express at Malda Town station at around 6 AM but were asked by the police and district administration officials to go back as prohibitory orders had been promulgated in Kaliachak. “This act of West Bengal government is condemnable,” Yadav said as the MPs were forced to return by Howrah-bound Shatabdi Express. BJP said its leaders will meet the Union Home Minister to demand setting up of an inquiry into the violence and also approach President Pranab Mukherjee on the issue. The Trinamool Congress lashed out at BJP, accusing it of trying to make it a commual incident to polarise voters as assembly elections were less than 100 days away in West Bengal and claimed that the saffron party will fare worse then it did in Bihar. Violence had broken out at Kaliachak, about 30 km from here, on December 3 over an alleged remark of a BJP leader. Protesters had set fire to a police station and damaged vehicles. The area has been made out of bounds for BJP leaders since the incident. On January 6, another BJP delegation led by Shamik Bhattacharya, its lone MLA in West Bengal Assembly, was not allowed to visit Kaliachak village. The BJP MPs today stayed in the VIP lounge of the station for nearly three hours where they discussed the issue with senior district officials who turned them back. “We are not here to incite or instigate anyone. We are law-abiding citizens and senior MPs but the officials said that we are public figures and our appearance will create problems....the normalcy they have achieved will break down,” he said. The three leaders said they were here to understand the chain of events in Kaliachak that led to the violence. Chief Minister Mamata Banerjee had said there was no communal tension in the area and described the incident as a fallout of an issue between BSF and the local people. Several policemen have been transferred from Kaliachak police station following the incident. “It is a poor attempt by BJP to make it into a communal insensitive,” Trinamool Congress MP Derek O Brien said, adding that it was a “criminal” incident, which was “tactfully” handled so no one was hurt and 10 persons have been arrested. He alleged that the BJP was acting in pursuance of its “communally insensitive narrative” as elections were due in April and was using its “social media army” to stoke the Malda fire. “The opposition, which is known to commualise the situation, is trying to change narrative but when the election results come out in April, it will be clear that people will put their faith in the development agenda of Mamata Banerjee Government,” the Trinamool leader said. 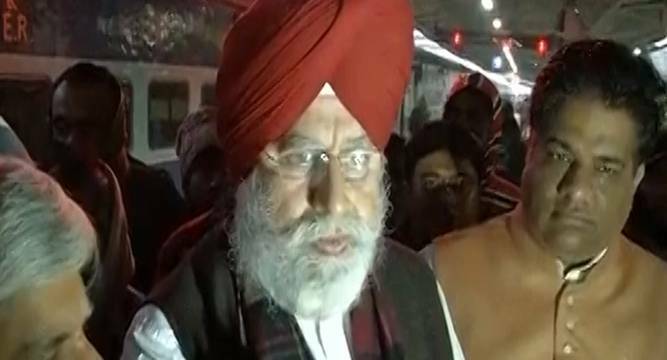 Asked if he raised with the officials the issues of communal tension and the role of police, Ahluwalia said that they were informed that the investigation was still on. “We will give out report to party chief Amit Shah,” he said. Before leaving, the MPs said that the situation must be “really bad” in Kaliachak. The CPI(M) attacked both the Trinamool Congress and BJP alleging that the two were making the state suffer for their narrow political interests. While Trinamool has provided “patronage” to some fundamentalist elements within the minority community, BJP was trying to inflame passions, CPI(M) leader Brinda Karat alleged.